Do we really need the House of Councilors? 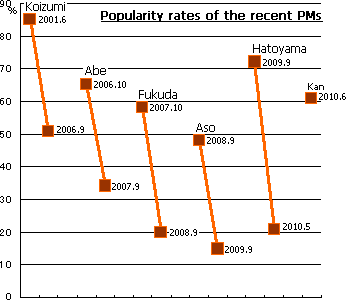 Why did Prime Minister Hatoyama resign ? Prime Minister Hatoyama resigned less than 9 months after his nomination. Hatoyama was the first Prime Minister of the Democratic Party (DP) after its historic victory in the election of the House of Representatives held in August last year. One of the reasons for the short duration of Hatoyma Cabinet was people's suspicion about the doubtful handling of political funds by Hatoyama himself and his powerful ally Ozawa Ichiro, Secretary General of the DP, who also resigned from his post in the same timing as Hatoyama. However, the much more decisive factor was the nation's disappointment in the political leadership of Hatoyama. He promised much and clearly, but frequently changed his standpoints and delivered very little. A good example was his handling of the relocation issue of the American base at Futenma in Okinawa. When the DP won the lower house election, Hatoyama underlined his firm will to realize the Manifesto. I, however, wondered whether those Manifesto goals were worth pursuing and whether the voters really wanted the DP to materialize those policies. Many people became disgusted by the corruption and incapability of the Liberal Democratic Party (LDP) after the resignation of Prime Minister Koizumi in September 2006 and chose the DP so as to break the stagnation of the Japanese politics, but did not much care the details of its Manifesto. When I checked the Manifesto, I was very surprised and disappointed at the same time, because there were a series of short-sighted hollow promises which required money after money including the yearly child allowance of 312,000 yen for all children (2.7 trillion yen), individual household income support for agriculture (1 trillion yen) and elimination of highway tolls (1.3 trillion yen). In contrast to this endless list of lavish spending, there was no concrete idea to increase the revenue, though the Japanese budget was on the verge of collapse with its 880 trillion yen long term debt. I strongly doubted, for example, what benefit the household income support could have for the nation as a whole. The Manifesto promised that this could revitalize agricultural communities and increase the Japanese food self-sufficiency rate. I could not agree to this explanation, because the increased subsidies, in particular those for petty farmers - most of them do farming on the side - would only deprive the Japanese agriculture of its vitality to increase competitive power. They might be petty as farmers. But, in most cases they are well off as employees or as pensioners. Their "agriculture" is meaningless for the national economy, but their votes are extremely valuable. Why should we support them in lieu of the vitalization of provinces? The intention to raise the food self-sufficiency rate is simply irrational. Higher self-sufficiency would never increase the food security of Japan, but only damage the sound development of agriculture, contribute to the worsening of governmental budgetary position and the Japanese competitiveness as a whole and isolate Japan in international trade relations. I came to believe that the Democrats, especially a part of their leaders did not much care the future of Japan but the outcome of future elections and their Manifesto targeted the weak segments of the people and promised them cash so that they would show favorable voting behavior for the DP; POPULISM! On the other hand, the issues concerning the American base in Okinawa and the set back of the market oriented Koizumi reform of Japan Post were both highly biased by the coalition partners, the Social Democratic Party (SDP) and the People's New Party (PNP). As for the security relations with the US and the overall security policy of Japan, we need thorough discussions before making any substantial decision. It was too short-sighted for a PM to deny the existing agreement, thought it had been reached by the LDP government with the American administration when the DP was in the opposition. Though there was no reference to the issue of Okinawa base in the Manifesto, Hatoyama as the party leader repeatedly declared that he would relocate the Futenma base "at least" to somewhere outside of Okinawa and added fuel to the fire which was about to go out. He also invited the Social Democrats as coalition partners, though their foreign policy was fundamentally anti-American and isolationistic, and that was a fatal mistake. I cannot believe why he thought that he could change the agreement to move the essential part of Futenma base to Henoko, which was a compromise after long and tedious negotiations and consultations among all parties concerned. Now, the DP has moved in a realistic way and the SDP is out of the coalition(*). The political damage resulted from this bewilderment is huge. Social Democrats left the coalition on May 30 after the cabinet decision to endorse by and large the agreement between the LDP administration and the US. On the other hand, the reform of Japan Post was referred to in the Manifesto and this was to attract the votes of the people profiting from the works related to provincial post offices. Nevertheless, the issue became disproportionately large in the political agenda, because this was the raison d'être of the PNP. They were the former LDP members who were ousted by the then PM Koizumi, when he fought an election to gather support to his reform policy. Therefore, I can say that the PNP is essentially a highly repercussionist party. Those two coalition partners are thus fundamentally very conservative and repercussionist. The fact that the DP chose them as coalition partners indicates that the DP is also very conservative despite of its reformist appearance, maybe more conservative than the LDP in their political style. Anyhow, the two coalition partners of the DP have only a small number of seats in both houses of the Diet, as you see in the table below. However, the DP does not possess a majority in the House of Councilors (upper house), though it has a strong majority in the House of Representatives (lower house). Therefore, the two tiny parties came to assume disproportionately big influence in the politics. I think this is not the situation the Constitution foresaw. Though, the coalition parties possess the majority also in the upper house now, this is resulted from the conversion of a few former LDP parliamentarians to the DP. At the beginning of the Hatoyama government, it could ensure majority in the upper house only with the members of the SDP. Do we need the House of Councilors? This stimulates us to give second thoughts on the role of the House of Councilors. We know that it replaced the House of Peers under the present Constitution. Originally, the Hose of Councilors was conceived as a house of common sense and it should discuss various political issues from higher and longer perspectives. Therefore, the term for its members is fixed to for 6 years and it can not be dissolved. However, the center of political power rests in the House of Representatives - for example, Prime ministers are erected from among the members of the House of Representatives - and the role of the House of Councilors is expected to check the abuse of power by the House of Representatives. However, the politics in the recent years show us that the House of Councilors is not any more a house of common sense but simply a second echelon of the House of Representatives. On the other hand, though the House of Councilors was originally expected to execute a subordinate role, it has a sort of veto to the House of Representatives and the majority party in the House of Representatives is often trifled by the strong opposition in the House of Councilors as if "the tail waggles the dog". I cannot but think that such a House of Councilors is harmful to the effective and democratic decision making. We spend 42 billion yen tax money for such a house every year including salary for its members. Extra budget is required for an election year and it amounts to be 58 billion yen. If the House of Councilors decides the same as the House of Representatives, it is only redundant and if it decides contrary to the latter, it is only detrimental, as is often said. In addition, as I explained above, the House of Councilors - whose members are ensured their position for as long as six years and the structure of the house does not reflect the current opinions of the people - distorts the results of the election in the House of Representatives. The majority of the Japanese people voted at the last general election for the DP and not for the SDP and PNP. But, the recent political situation was largely dictated by them who are supported only by a few per cent of the whole nation. In order to put an end to this crazy situation, we should amend the Constitution and abolish the House of Councilors. We should have courage to abolish it like New Zealand, Sweden and Denmark. The next election of the House of Councilors takes place in July. The DP expects it can win the absolute majority also in the upper house now that the new PM Kan has recovered the popularity of the DP. However, this bonus for the initial phase of a PM cannot last long and the popularity rate of Kan is not especially high in comparison with his weak LDP predecissors. We have to wait and see what will happen at the coming upper house election.